The Barracks lie in a housing estate west of the main city, accessible off the main street via a walkway past a church. 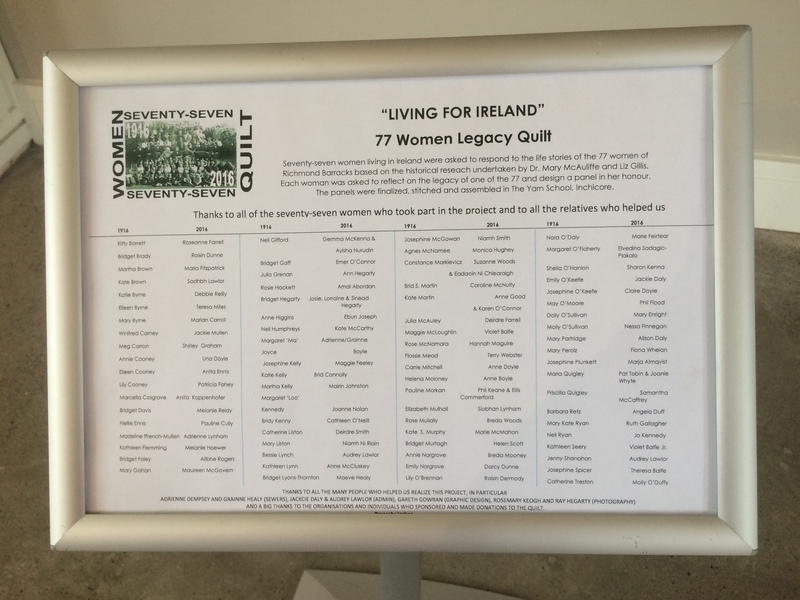 The quilt is displayed on the wall of the room where the 77 women were sat following their arrest after the Rising. Immediately its presence becomes poignant. 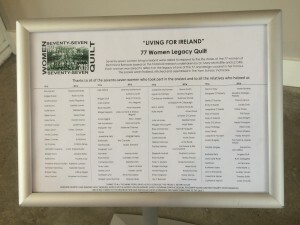 For me the power of the quilt lies not just in its size and situation, but in the faces that stare out- real women in real photos that had been extracted from family and friends and reporting photographers of the time, and ‘imaged’ onto fabric. 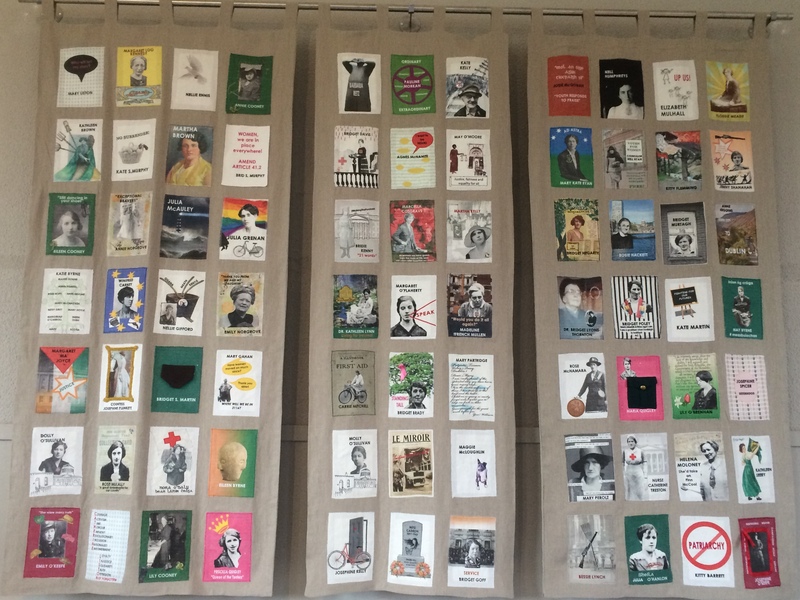 These are not ‘abstract’ squares in any manner and no longer ‘hidden names’ in the witness documents of the time, but women who are brought to the forefront of the struggles and given voice from a time when many women’s voices are muted. Some of the pictures depicted had been provided by family, the faces never before seen in histories of the period. The squares spoke of a desire for equality, not just for gender, but for the poor and social outcasts of Ireland. I cried as I stared at it. The sense of social history being presented through ‘craft’, often regarded as ‘second rate women’s work’, was intensely meaningful. [see for example, MaryBeth Stalp’s book Quilting: The Fabric of Everyday Life (Dress, Body, Culture) (2007), the work of Ann Rippin in Management studies http://www.bris.ac.uk/efm/people/ann-j-rippin/overview.html and Harriett Shortt in relation to Hairdressers https://harrietshortt.wordpress.com/tag/quilt/ ]. It reminded me again how research and evidence of women’s stories can be presented in a different way through art and celebrate them in a way that is deeper than through words alone. At the present time the quilt is quietly hidden in the Barracks and we felt immensely privileged to be there to view it, within the context of the room where those women had sat. We were also privileged to meet Eadaoin Ni Chleirigh, CEO of the project, who passionately shared the vision of the quilt and the restoration of the Barracks in the context of the community it is placed. As with my own quilt, over time it will find its own voice and speak in a different way to future generations. 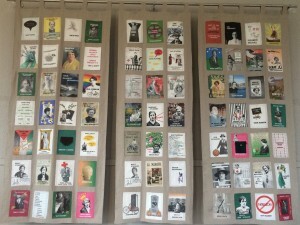 If you find yourself in Dublin take time to go and visit the project and stand in awe in front of the quilt. Pay homage to those women whose courage and willingness to step beyond the social norms of the time, paved a way for future generations. Then question why, a century on, women in Ireland, England and globally are still not treated ‘equally’ in society [ https://www.ifs.org.uk/publications/8429 https://www.theguardian.com/commentisfree/2016/mar/25/100-years-after-easter-rising-irish-women-still-fighting-gender-equality http://www.theweek.co.uk/67020/gender-equality-around-the-world-the-best-and-worst-countries ].